But someone told the king of Jericho, “Some Israelites have come here tonight to spy out the land.” So the king of Jericho sent orders to Rahab: “Bring out the men who have come into your house, for they have come here to spy out the whole land.” Rahab had hidden the two men, but she replied, “Yes, the men were here earlier, but I didn’t know where they were from. They left the town at dusk, as the gates were about to close. I don’t know where they went. If you hurry, you can probably catch up with them.” (Actually, she had taken them up to the roof and hidden them beneath bundles of flax she had laid out.) (Joshua 2:2-6 NLT). So the two men [the spies] set out and came to the house of a prostitute named Rahab and stayed there that night (Joshua 2:1b NLT). Rahab, a prostitute, was an unlikely hero as the Israelites were preparing to enter the Promised Land. Rahab didn’t fit the Bible hero stereotype, and her poor life choices could have easily disqualified her from being used by God. Yet, despite her poor choices, God used her in a big way. This affirms the truth that what we assume God will or won’t do in the lives of certain people might be way off. The truth is, it’s tempting to look at a person’s actions and reputation and pass judgment. However, just as God used Rahab despite her actions and reputation, God can use the people around us. And since we don’t know a person’s entire story, nor what God might have planned for a person, we should be careful not to rely on our assumptions and pass judgment. If you’ve watched more than a few movies, you’ve probably seen all kinds of tropes. We look at someone or observe what they say and do, and we immediately categorize who they are. Interestingly, our assumptions about people tend to lean toward the negative. And why do assume the worst? I think we do this for two reasons. Classifying people makes things easier. We’ve seen this movie before, right? When we automatically assume that someone is bad, we might just be in the process of becoming a type of villain ourselves. We might be becoming haters. That’s the problem with a trope—it isn’t always true. The trip to get to the Promised Land was epic, and it took about 40 years. Once they arrived in the Promised Land, they discovered there was one small problem: Seven entire nations already lived there! Joshua, the new leader of the Israelites after Moses, sent a couple of spies across the border to do some recon work in the city of Jericho, located in the land God had promised them. A resident of the city, a woman named Rahab, offered her home as a place to hide until the spies could sneak out. Rahab was a prostitute. Not exactly the kind of person you’d expect to be a Bible hero. Later we learn the Hebrews eventually conquered the city of Jericho, and because of Rahab’s brave act, Joshua spared her land and her family’s lives. More than a thousand years later, Rahab’s name appears in the Bible. Why wouldn’t Matthew just skip over her name and hope that no one noticed? To show that what we assume about others isn’t always true. God doesn’t judge people by appearances. He doesn’t determine our value based on what we do or say. There’s so much more to who you are than the assumptions others make about you. 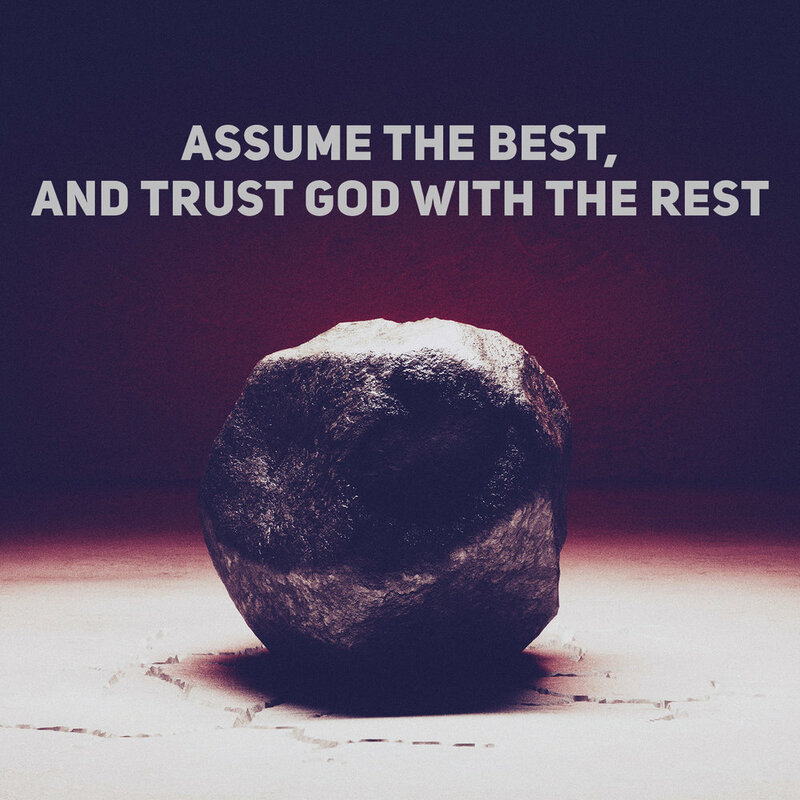 Assume the best, and trust God with the rest. As you leave today, think about some people you’ve put in a category, and then think about what it would look like to assume the best in them.